Football Dreams Teasers April 2019 – Upcoming EVA drama series ‘Football Dreams’ teasers, previews, updates, episodes, highlights and spoilers for April 2019. In the elimination round of the world cup in the United States 1994, the members of the Colombian football team get ready to play Argentina. After celebrating the win of Colombia against Argentina, each member of the team celebrates with their family members. Viviana decides to tell Ivan she is worried about her pregnancy as she does not want to feel alone. The Colombian national team is able to issue a promotional calendar regardless of the issues Tino has been having in Italy. While being freed from jail and getting his freedom, Higuita is approached by the national press to clarify his connection to Pablo Escobar. America and Junior play each other and the latter wins, prompting a fight between Freddy and Pibe. Clarisa, Pibe's wife, goes and visits Yadira who is about to give birth and as the hours pass by the family finds out about Viviana's existence. Tino and Caremonja's kidnapper in Italy lets everyone know that he's Tino's number one fan, and explains to them the reason why he is doing this. Worried about his legal situation, Higuita considers mortgaging the house even though his wife warns him not to, so that he can pay his lawyer. Following Faustino's success as football player, he is able to buy an expensive horse for his wife, Carolina. In Colombia, Higuita confronts the lawyer, rejecting the help he was offering to help him get out of all his legal problems. Eugenia, Caridad's mother, plans on getting Caridad and Freddy alone in a romantic place so that they can get together again. After the deal Pibe made with his mentor, he decides to keep his promise, but in an unforeseen moment the old man dies from cardiac arrest. Viviana, one of Ivan's love interests decides to name her son Ivan, a decision that will bother Yadira in the baptism of her own son. Eugenia, Caridad's mother, continues her plan to bother her daughter and make her life a little more difficult. After his father was assaulted by a group of men, Higuita decides to confront them. Eugenia, Caridad's mother, kicks Julio Cesar out from her house causing Caridad to make the decision to send her back to Colombia. During Valenciano's birthday party a fight breaks out between Yadira and Viviana. Magnolia, Rene Higuita's wife, abandons him when he doesn't resist his personal problems. Days later, two men come to his house with a warrant. The roster is announced for the players that will be representing the Colombian National team in the 1994 world cup. Rene Higuita's family go to a ranch to watch the world cup, as they want to cheer him up, since he was not asked to play for the team. The world cup begins and Colombia lose their first game against Romania. The press immediately talk about how the players failed. 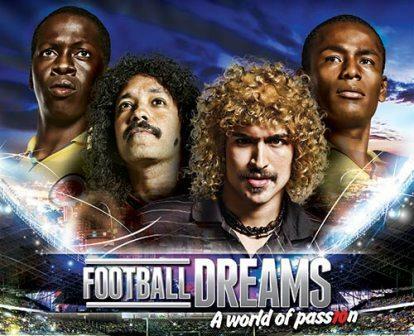 Premiere episodes of Football Dreams air on EVA from Mondays to Fridays at 14h00. The primetime reboradcast airs at 20h00.